What are Career options after Getting an MBA Degree? MBA stands for Master of Business Administrator. It is the technical and professional course. The master degree in MBA covers various business areas such as human resources, accounting, marketing, finance, business law, management entrepreneurship etc. This course was started in the 20th century in America. It is the very expensive course. The Wharton School of the University of Pensylvania established in 1881 is the first school of business. MBA adopted by almost all the countries of the world. There are various colleges of MBA are established in India. Some top colleges of MBA in India are Indian Institute of Management Ahmedabad (IIM), IIM Banglore, IIM Calcutta, Xavier school of management, Anna University, GNDU University Amritsar, Delhi University, FMS International Management Institution etc. It is one of the best career options after MBA. It is a job about to provide advice to companies in their management field for achieving goals. Management Consultant also provides identifying problems of business. People can earn more in the field of a management consultant. A management consultant can work for some company or self-employed. So this is the best career option after MBA. Finance is the main part of the business, so for taking the best planning in business financial advisors are needed. A financial advisor can also help for retirement planning for families, Education planning for children etc. Financial advisors looking for the best investment opportunities for their clients. 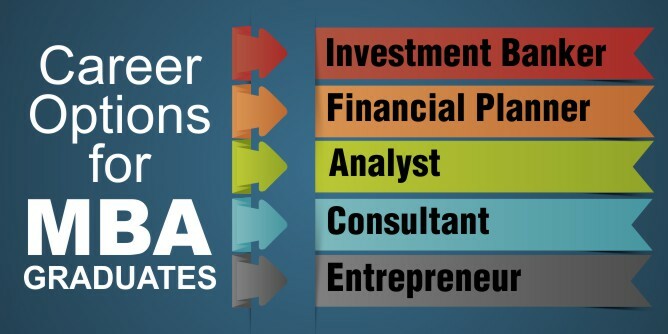 So, Financial Advisor is also one of the best career options after MBA. The main task of the marketing manager is to manage the marketing resources and products. The marketing manager is very useful for the business firm and it is also a very beneficial career option for MBA students. The main task of the Marketing Manager is to provide the best marketing plan for a business. They also provide the best planning for achieving the goals of a business. The daily operations of the business such as purchasing, investing, policy planning, coordination among department is oversees by the operations manager. The daily working of a firm or company is controlled by the operations manager. So it is also the best choice for MBA students. Investment Banker is another career option for MBA students. The main task of Investment Bankers is to help for investing in equity and debt to increase the profit of the company. They also help in advising in various investment policies. They also help with financial transactions at the time of mergers and acquisition. These are the best career options for students after completing MBA. Students can choose one of them according to their choice for their better future.